Well, the Summer Olympics ended last weekend and now I remember why they only happen every 4 years. It’s been fun to watch some of the worlds best compete and break records, but after more than two weeks of it I’ve had enough. Not to miss a beat, The Onion reported last week “Michael Phelps Returns To His Tank At Sea World“. ORLANDOâ€”Fourteen-time Olympic gold medalist and SeaWorld main attraction Michael Phelps returned to his seven-million-gallon water tank Wednesday to resume his normal schedule of performing in six shows a day for marine park crowds every day of the week. A world class NERF war! I’m sure this is a commercial, but it’s a damned good one! All 5 minutes of it! Thanks to Don for sending this on to me. Posted on July 9, 2008 Categories Entertainment, Fun and GamesTags Leave a comment on A world class NERF war! OK, I’m not a big literature or theater geek (but I make up for it in other geek areas) but when this song came over the feed from The FuMP I just about fell out of my chair laughing! The song is a simply brilliant spoof on Shakespeare to the tune of Don McLean’s masterwork American Pie by the hilarious Robert Lund. Listen to the whole song, right here, right now, and check out The FuMP for more along these lines! Now that’s commitment! I’m not sure it’s the ultimate, but it’s easily one of the best I’ve seen yet! Posted on February 1, 2008 Categories Entertainment, Fun and GamesTags , fun, Funny, hilarious, Office, office humor, prank1 Comment on The ultimate office prank? 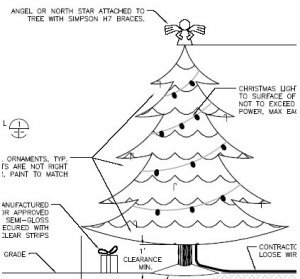 I’ve written about it before, but it’s that time of year and I know some of you are wondering exactly how many bails of hay should be placed out for the reindeer (8) or what type of brace to use to secure the angel to the tree (Simpson H7), so here’s the gratuitously detailed PDF for holiday decoration.